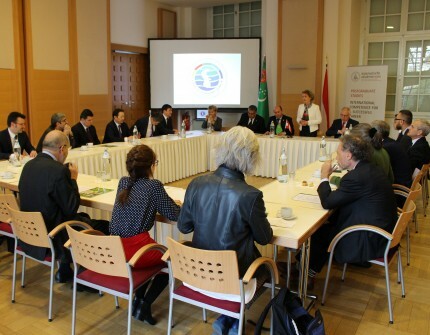 On March 27, 2019, the Embassy of Turkmenistan in the Republic of Austria organised a round table at the Diplomatic Academy of Vienna, as well as presentation of the First Caspian Economic Forum. High-ranking officials of the Austrian Foreign Ministry, delegation of Turkmenistan, Ambassadors and representatives of the Central Asian states and neighbouring countries, university professors, scholars and representatives of the Turkmen-Austrian society attended the event. Leadership of the Diplomatic Academy of Vienna, rector of the Institute of International Relations of the Ministry of Foreign Affairs of Turkmenistan, professors of higher educational institutions of Austria and the members of the Turkmen-Austrian society made presentations during the event. In their speech, Turkmen side acquainted the participants with the priority directions of the Turkmenistan’s foreign policy, in particular, in the fields of energy, transport and water diplomacy. Besides that, the participants were acquainted with the activities of the Institute of International Relations of Turkmenistan. After that, presentation of the First Caspian Economic Forum was made during the gathering. Participants were acquainted with the content of the economic, energy and transport strategy of Turkmenistan, its investment opportunities, the country's policy in the field of ecology and conservation of Caspian bioresources, as well as the conceptual agenda of the event to be held on August 12 of this year. A video about the preparations to the first Caspian Economic Forum was shown to the participants at the end of the round table.